Helen V. Capuano (nee Jameson), age 85, a former resident of Evergreen Park, IL and Bolingbrook, IL, passed away peacefully on Thursday, January 24, 2019 at The Scottish Home in North Riverside, IL. She was born on July 15, 1933 in Nutley, NJ to the late George and Helen Jameson. Beloved mother of Mary Lynn (Steve) Wolfram of St. Joseph, MI, John F. (Lora) Capuano of Naperville, James "Jim" (fiancée, Stacey Duncan) Capuano of Naperville and Jeanne (Michael) Kelly of Downers Grove, IL, adored grandmother of Steve Calandriello, Dan (Jamie) Calandriello, Stephanie (Ken) Koern and Samantha (Eric) Stutz; Algenia, Casey Helen and Victoria Capuano; Courtney and Alison Capuano; Andrew, Brittany (fiancé, Adam Schlafhauser), David and Bridget Kelly, cherished great-grandmother of Cadence Calandriello; Anna and Owen Calandriello; Connor, Carter, Corrina, Charlotte and Cooper Koern, devoted daughter of the late George and Helen (nee Sedlar) Jameson, dear sister-in-law of Dody (the late Larry) Gallagher, Jack (Maureen) Capuano, Bonnie (Tom) Nowak, Tommy (Danny) Capuano and the late Sr. Donna Capuano, OSU, former spouse of Richard J. Capuano of Palos Heights, IL, former mother-in-law of Wendy Capuano of Naperville, loving aunt, great-aunt and friend of many. Helen grew up in Nutley, NJ, and Cleveland, OH, where she graduated from Notre Dame High School (Class of 1951). She married and moved to Chicago in the mid-1950's eventually raising her family of four children in Evergreen Park, IL. A devoted Catholic, Helen was an active parishioner at Most Holy Redeemer Catholic Church in Evergreen Park, where she worked in the Religious Education Office and was President of the Altar & Rosary Society. In her 40's Helen went back to school and earned a degree in Family Studies from St. Xavier University, Chicago (Class of 1983). She worked for many years as a substance abuse addictions counselor at Christ Hospital in Oak Lawn, IL. She was very proud of her career and received great personal joy from helping those in need. Helen moved to Bolingbrook, IL, in 1990 and was a member of St. Francis of Assisi Catholic Church and later, St. Raphael Catholic Church in Naperville, IL. 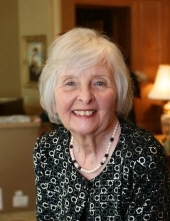 She had a strong faith in God and connected with Him through nature, especially in her long walks at the Morton Arboretum (Lisle, IL), where she was also an active volunteer for many years. She was an avid gardener, blessed with precious friendships, enjoyed dancing and music, and found immense joy in the lives of her grandchildren and great-grandchildren. Visitation Thursday, January 31, 2019, 4:00-8:00 PM at Friedrich-Jones Funeral Home & Cremation Services, 44 S. Mill St, Naperville, IL. An informal sharing of special memories to honor Helen will take place Thursday, 7:00-7:30 PM in the funeral home. Services will begin Friday, February 1, 10:15 AM from the funeral home and will proceed to an 11:00 AM Mass of Christian Burial at St. Margaret Mary Catholic Church, 1450 Green Trails Dr., Naperville. To send flowers or a remembrance gift to the family of Helen V. Capuano, please visit our Tribute Store. "Email Address" would like to share the life celebration of Helen V. Capuano. Click on the "link" to go to share a favorite memory or leave a condolence message for the family.